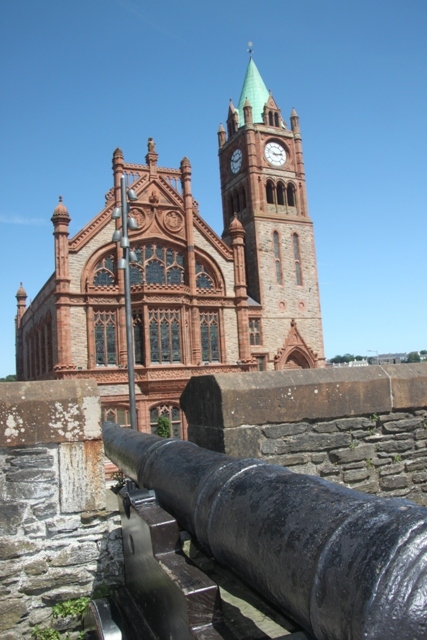 Derry/Londonderry is spruced up and ready to celebrate its new status as a tourist hotspot. My memories of my last visit as a teenager, were of a sombre, drab, gloomy and depressing city. Things have changed. A cosmopolitan air, buzzing with life and vitality, this is a city coming into its own. We started our exploring at Guildhall Square, the heart of the city. This beautiful sandstone building is looking top notch after a mega expensive renovation project. I loved the stain glass windows but son was more taken with the ice cream shop nearby. I have to concede, this too was pretty fantastic with what seemed like every ice cream flavour under the sun and then some. We indulged ourselves. The Siege Heroes Museum was our first stop of the day. 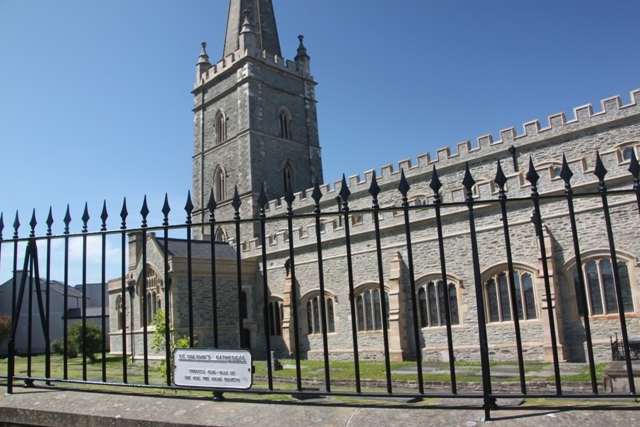 This is dedicated to the heritage and history of the famous battle – the Siege of Derry, which took place between 1688 and 1689. I have to confess a shocking lack of knowledge of aforementioned battle, but this place put that to rights. The building itself is beautiful, inside they have a little exhibition on the first floor all about the siege. We watched a couple of historical videos which Son also enjoyed and had a meander around all the bits and pieces they have on display. It is a bit haphazard, a bit random and eclectic but I loved that. 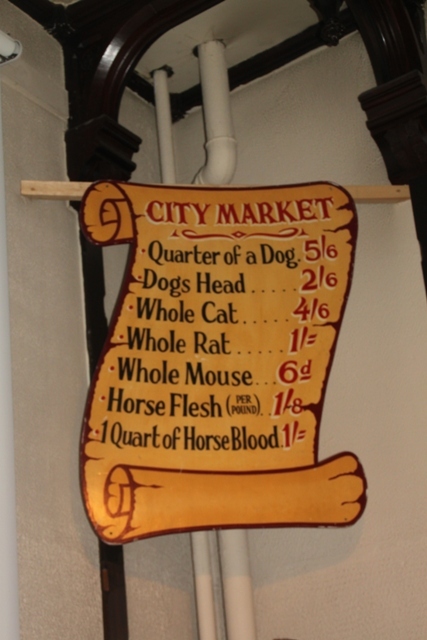 The odds and ends they have there range from real historical treasures to tatty trinkets, a fascinating mix. We left with more facts in our heads plus a great little souvenir booklet which had a map of the city walls and interesting places to visit. Son seized on this mantra and used it on us – his way of getting out of the church, he’d had his fill of history by now. We surrendered and took him outside. The Diamond in the middle of the city, where four ancient gates converge, was where we were headed. There we found Austins, the oldest independent department store in the world (pre-dating Harrods by 15 years) and the chance it might have a toy department to browse around. Last, but not least, we made our way to the new Peace Bridge. 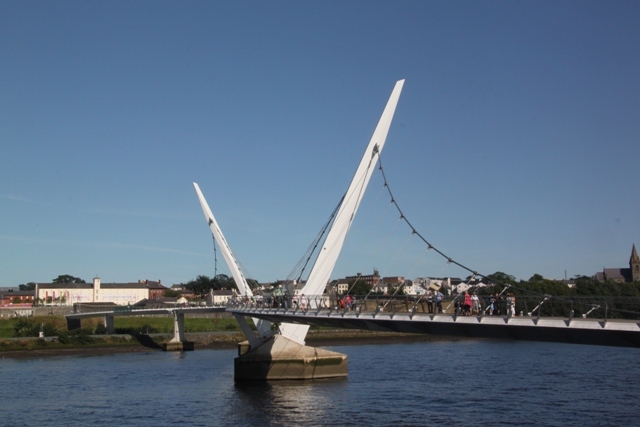 It stretches across the River Foyle and was opened in 2011 to symbolise peace and reconciliation. It is lovely. We walked across to the middle of the bridge for an alternative view of this city and its wonderful walls. 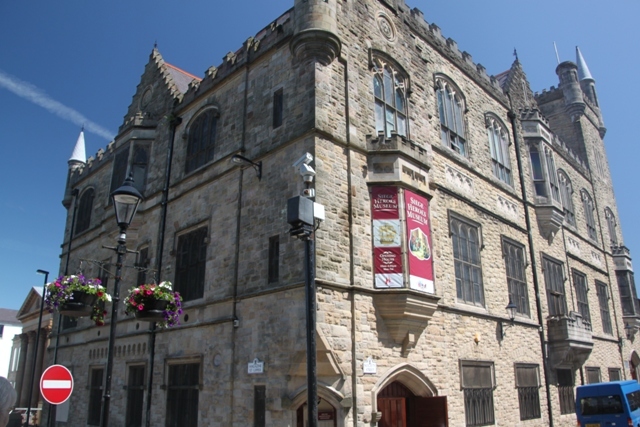 We loved our time in the Maiden City, such a different experience to when I last visited. This is a city on the up, I am so glad to see its renaissance in appearance and perception. It wholly deserves its new tourist hotspot status, I hope some day we will be back. I noticed under France, you did not go beyond Paris. If you ever return and explore beyond that magnificent city you will see so much! I love France and we have been to other parts including Normandy, Brittany, the Champagne region, Bordeaux, the French Alps, Nice and Provence. I know what you mean though, there is so much to see and do a lifetime would not be enough! Thanks for dropping by.